fiord. Piopiotahi (Milford Sound) was his greatest achievement. The goddess of the underworld, Hine-nui-te-po, came to see the handiwork of Tu and was so alarmed at the beauty of Piopiotahi, that she worried that once people had seen the fiord they would not want to leave its beauty. To encourage humans to not dwell too long she released the sandfly into Milford Sound! Milford Sound is the most famous and accessible of the grand glacier carved fiords scattered along New Zealand's south western coast. Mountain peaks with sculptural, hanging valleys, send waterfalls cascading over sheer granite cliffs to the sea below. Boat trips on the Sound are a must and provide close up views of awe-inspiring scenery. These cruises are often accompanied by playful dolphins, and seals basking on rocks are a common sight. The Fiord is approximately 16km from the ‘head’ to the open sea, which means visitors can comfortably travel the length of the fiord to the Tasman Sea and return in only 1½ to 2 hours. There are many cruise options available for this. 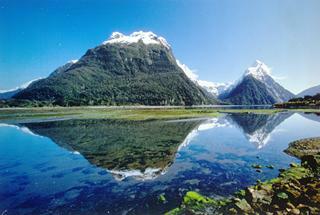 Milford Sound is also becoming increasingly popular for adventure on the water such as kayaking and diving. Kayaking is an experience in the sounds that is unforgettable; most people kayak very early in the morning or late afternoon. There is an opportunity to dive in an incredible marine environment. Dive to see Black and Red corals living in depths of less than 20 metres. There are a multitude of other marine animals to be seen in relatively warm clear waters of the Fiords. Milford Sound also has an underwater observatory with viewing facility to enable visitors to experience life below the surface of Milford Sound. The observatory is a permanent window to life nine metres beneath the sea in the Piopiotahi marine reserve. The road to Milford Sound is one of the world's finest alpine drives. From Te Anau the road winds down the Eglinton and Hollyford Valleys then through the Homer Tunnel to be met by Mitre Peak towering from the glassy waters of Milford Sound. For those self-driving at a more leisurely pace, there are many sightseeing and short walk opportunities; if you have bookings for cruises, please allow adequate time. Milford Road - Leaving Te Anau and heading north the visitor follows 119 km of tar-sealed road to the majestic Milford Sound. Numerous short walks and scenic views can be enjoyed along the road which takes the traveller from the green grass of lowland pastures through stands of native bush and finally into the rocky, mountainous area around the Homer Tunnel - gateway to Milford Sound. The road to Milford Sound is highly scenic and for those self-driving on a more leisurely itinerary, you may wish to experience the following stops and short walks. Te Anau Downs - This sheltered harbour is the departure point for Milford Track walkers. Lake Mistletoe - Enjoy an easy walk through regenerating beech forest to a small glacial lake (45 minutes return). Boyd Creek - An easy 250m walk to view a small stepped waterfall. Mirror Lakes - Small tarns situated roadside, famous for their mountain reflections in calm weather. Knobs Flat - Provides visitor amenities including interpretation displays, toilets, campervan sewage disposal and telephone (card only). Lake Gunn Nature Walk - This pleasant walk via a loop track takes you through red beech forest to the shores of Lake Gunn. On the way a variety of mosses and native birds can usually be seen (45 minutes return). Wheelchair accessible. The Divide - This is the lowest east-west pass in the Southern Alps (531m) and it marks the start of the Routeburn, Caples and Greenstone Tracks. Shelter and toilets are provided. Key Summit - This walk from The Divide initially follows the Routeburn Track. It takes you through native forest, then over open ground with alpine tarns, shrub land and bogs. The Key Summit viewpoint provides spectacular views of the Hollyford, Greenstone and Eglinton Valleys (3 hours return). Routeburn Track - This popular three day walking track to Lake Wakatipu takes trampers over a high alpine pass (1277m). Hollyford Valley Lookout (Pops View) - Provides spectacular roadside views over the Hollyford Valley. Marian Corner - The avalanche gates at Marian Corner are closed whenever there is avalanche danger to motorists. Lower Hollyford Road - The Hollyford Road turn-off leads to the Lake Marion Walking Track, Gunns Camp, Humbolt Waterfall and Hollyford Track. Lake Marian - A walk through silver beech forest into the Marian Valley departs from the Marian swing bridge, which is 1km down the lower Hollyford Road from Marian Corner. The track leads you to an idyllic picnic spot beside Lake Marian, affording superb alpine views (3 hours return). Gunns Camp - Cabin accommodation is available at Gunns Camp. The early settlers museum is well worth a visit. Homer Tunnel Nature Walk - From the eastern end of Homer Tunnel you can take a short walk through the alpine zone. The native plants are a delight to view, particularly in the December/January flowering period. Keas are frequently seen here (please do not feed them). Homer Tunnel - This 1219m long unlined road tunnel (two-way traffic) slopes down toward the Milford side with a gradient of 1 in 10. The Chasm - An impressive rock chasm formed by the rushing waters of the Cleddau River. The loop forest walk offers views of waterfalls and sculptured rock formations (20 minutes return). Please stay behind safety barriers. Keas - Please do not feed the keas as this is harmful to their survival. Petrol - When self driving to Milford please ensure that you have a full tank of petrol when leaving Te Anau (240km return). Snow Chains - Chains must be carried during the winter months (May - November). Car Parking - A car parking area is provided at Milford Sound, 10 minutes walk from the Visitor Terminal (cruise departure point). Check In - Check in is 20 minutes prior to cruise departures.